235365 SAA4D107E-1 KOMATSU Diesel Engine SAA4D107E-1 Spare parts catalog. Service(Shop) Manual. 235366 SAA4D107E-1A KOMATSU Diesel Engine SAA4D107E-1A Spare parts catalog. 235367 SAA4D107E-1A-M KOMATSU Diesel Engine SAA4D107E-1A-M Spare parts catalog. 235368 SAA4D107E-1A-W KOMATSU Diesel Engine SAA4D107E-1A-W Spare parts catalog. 235369 SAA4D107E-1A-WK KOMATSU Diesel Engine SAA4D107E-1A-WK Spare parts catalog. 235370 SAA4D107E-1B KOMATSU Diesel Engine SAA4D107E-1B Spare parts catalog. 235371 SAA4D107E-1B-W KOMATSU Diesel Engine SAA4D107E-1B-W Spare parts catalog. 235372 SAA4D107E-1C KOMATSU Diesel Engine SAA4D107E-1C Spare parts catalog. 235373 SAA4D107E-1C-M KOMATSU Diesel Engine SAA4D107E-1C-M Spare parts catalog. 235374 SAA4D107E-1C-W KOMATSU Diesel Engine SAA4D107E-1C-W Spare parts catalog. 235375 SAA4D107E-1D KOMATSU Diesel Engine SAA4D107E-1D Spare parts catalog. 235376 SAA4D107E-1E KOMATSU Diesel Engine SAA4D107E-1E Spare parts catalog. 235377 SAA4D107E-1F KOMATSU Diesel Engine SAA4D107E-1F Spare parts catalog. 235378 SAA6D107E-1 KOMATSU Diesel Engine SAA6D107E-1 Spare parts catalog. Service(Shop) Manual. 235379 SAA6D107E-1-A KOMATSU Diesel Engine SAA6D107E-1-A Spare parts catalog. Service(Shop) Manual. 235380 SAA6D107E-1AA-M KOMATSU Diesel Engine SAA6D107E-1AA-M Spare parts catalog. 235381 SAA6D107E-1AA-W KOMATSU Diesel Engine SAA6D107E-1AA-W Spare parts catalog. 235382 SAA6D107E-1B KOMATSU Diesel Engine SAA6D107E-1B Spare parts catalog. 235383 SAA6D107E-1BA KOMATSU Diesel Engine SAA6D107E-1BA Spare parts catalog. 235384 SAA6D107E-1B-M KOMATSU Diesel Engine SAA6D107E-1B-M Spare parts catalog. 235385 SAA6D107E-1B-M1 KOMATSU Diesel Engine SAA6D107E-1B-M1 Spare parts catalog. 235386 SAA6D107E-1B-W KOMATSU Diesel Engine SAA6D107E-1B-W Spare parts catalog. 235387 SAA6D107E-1B-W1 KOMATSU Diesel Engine SAA6D107E-1B-W1 Spare parts catalog. 235388 SAA6D107E-1B-WK KOMATSU Diesel Engine SAA6D107E-1B-WK Spare parts catalog. 235389 SAA6D107E-1C KOMATSU Diesel Engine SAA6D107E-1C Spare parts catalog. 235390 SAA6D107E-1CA KOMATSU Diesel Engine SAA6D107E-1CA Spare parts catalog. 235391 SAA6D107E-1CC KOMATSU Diesel Engine SAA6D107E-1CC Spare parts catalog. 235392 SAA6D107E-1C-M KOMATSU Diesel Engine SAA6D107E-1C-M Spare parts catalog. 235393 SAA6D107E-1C-M1 KOMATSU Diesel Engine SAA6D107E-1C-M1 Spare parts catalog. 235394 SAA6D107E-1C-W KOMATSU Diesel Engine SAA6D107E-1C-W Spare parts catalog. 235395 SAA6D107E-1C-W1 KOMATSU Diesel Engine SAA6D107E-1C-W1 Spare parts catalog. 235396 SAA6D107E-1C-WK KOMATSU Diesel Engine SAA6D107E-1C-WK Spare parts catalog. 235397 SAA6D107E-1D KOMATSU Diesel Engine SAA6D107E-1D Spare parts catalog. 235398 SAA6D107E-1DA KOMATSU Diesel Engine SAA6D107E-1DA Spare parts catalog. 235399 SAA6D107E-1DD KOMATSU Diesel Engine SAA6D107E-1DD Spare parts catalog. 235400 SAA6D107E-1D-M KOMATSU Diesel Engine SAA6D107E-1D-M Spare parts catalog. 235401 SAA6D107E-1D-W KOMATSU Diesel Engine SAA6D107E-1D-W Spare parts catalog. 235402 SAA6D107E-1E KOMATSU Diesel Engine SAA6D107E-1E Spare parts catalog. 235403 SAA6D107E-1EA KOMATSU Diesel Engine SAA6D107E-1EA Spare parts catalog. 235404 SAA6D107E-1E-W KOMATSU Diesel Engine SAA6D107E-1E-W Spare parts catalog. 235405 SAA6D107E-1E-W1 KOMATSU Diesel Engine SAA6D107E-1E-W1 Spare parts catalog. 235406 SAA6D107E-1F KOMATSU Diesel Engine SAA6D107E-1F Spare parts catalog. 235407 SAA6D107E-1F-W KOMATSU Diesel Engine SAA6D107E-1F-W Spare parts catalog. 235408 SAA6D107E-1G-M KOMATSU Diesel EngineSAA6D107E-1G-M Spare parts catalog. 235409 SAA6D107E-1G-MT KOMATSU Diesel Engine SAA6D107E-1G-MT Spare parts catalog. 235410 SAA6D107E-1G-W KOMATSU Diesel Engine SAA6D107E-1G-W Spare parts catalog. 235411 SAA6D107E-1G-WK KOMATSU Diesel Engine SAA6D107E-1G-WK Spare parts catalog. 235412 SAA6D107E-1H KOMATSU Diesel Engine SAA6D107E-1H Spare parts catalog. 235413 SAA6D107E-1H-W KOMATSU Diesel Engine SAA6D107E-1H-W Spare parts catalog. 235414 SAA6D107E-1J KOMATSU Diesel Engine SAA6D107E-1J Spare parts catalog. 235415 SAA6D107E-1JA KOMATSU Diesel Engine SAA6D107E-1JA Spare parts catalog. 235416 SAA6D107E-1J-M KOMATSU Diesel EngineSAA6D107E-1J-M Spare parts catalog. 235417 SAA6D107E-1J-W KOMATSU Diesel Engine SAA6D107E-1J-W Spare parts catalog. 235418 SAA6D107E-1K KOMATSU Diesel Engine SAA6D107E-1K Spare parts catalog. 235419 SAA6D107E-1KB-W KOMATSU Diesel Engine SAA6D107E-1KB-W Spare parts catalog. 235420 SAA6D107E-1L KOMATSU Diesel Engine SAA6D107E-1L Spare parts catalog. 235421 SAA6D107E-1N KOMATSU Diesel Engine SAA6D107E-1N Spare parts catalog. 235422 SAA6D107E-1Q KOMATSU Diesel Engine SAA6D107E-1Q Spare parts catalog. 235423 SAA6D107E-2 KOMATSU Diesel Engine SAA6D107E-2 Spare parts catalog. Service(Shop) Manual. 235424 SAA6D107E-2A KOMATSU Diesel Engine SAA6D107E-2A Spare parts catalog. 235425 SAA6D107E-2B KOMATSU Diesel Engine SAA6D107E-2B Spare parts catalog. 235426 SAA6D107E-2C KOMATSU Diesel Engine SAA6D107E-2C Spare parts catalog. 235427 SAA6D107E-2D KOMATSU Diesel Engine SAA6D107E-2D Spare parts catalog. 235428 SAA6D107E-2E KOMATSU Diesel Engine SAA6D107E-2E Spare parts catalog. 235429 SAA6D107E-2F KOMATSU Diesel Engine SAA6D107E-2F Spare parts catalog. 235430 SAA6D107E-2G KOMATSU Diesel Engine SAA6D107E-2G Spare parts catalog. 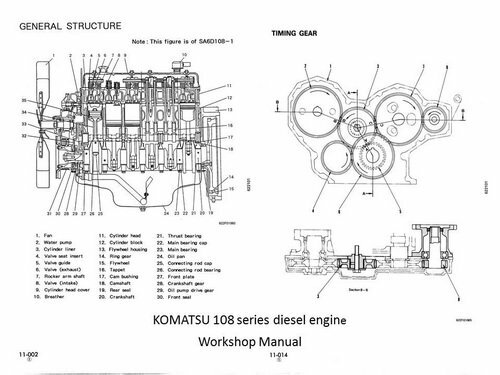 235445 6D108-1 KOMATSU Diesel Engine 6D108-1 Service(Shop) Manual. 235446 6D108E-2 KOMATSU Diesel Engine 6D108E-2 Service(Shop) Manual. 235447 6M108A-1 KOMATSU Diesel Engine 6M108A-1 Service(Shop) Manual. 235448 G-S6D108-1G2-D6 KOMATSU Diesel Engine G-S6D108-1G2-D6 Spare parts catalog. 235449 G-S6D108-1G2-E1 KOMATSU Diesel Engine G-S6D108-1G2-E1 Spare parts catalog. 235450 G-S6D108-1GD-D1 KOMATSU Diesel Engine G-S6D108-1GD-D1 Spare parts catalog. 235451 G-S6D108-1GD-D2 KOMATSU Diesel Engine G-S6D108-1GD-D2 Spare parts catalog. 235452 G-S6D108-1GD-D4 KOMATSU Diesel Engine G-S6D108-1GD-D4 Spare parts catalog. 235453 G-SA6D108-1G2-D7 KOMATSU Diesel Engine G-SA6D108-1G2-D7 Spare parts catalog. 235454 G-SA6D108-1GD-D4 KOMATSU Diesel Engine G-SA6D108-1GD-D4 Spare parts catalog. 235455 G-SA6D108-1GD-D5 KOMATSU Diesel Engine G-SA6D108-1GD-D5 Spare parts catalog. 235456 G-SA6D108-1GD-D6 KOMATSU Diesel Engine G-SA6D108-1GD-D6 Spare parts catalog. 235457 G-SA6D108-1GD-E4 KOMATSU Diesel Engine G-SA6D108-1GD-E4 Spare parts catalog. 235458 K-S6D108-1C2 KOMATSU Diesel Engine K-S6D108-1C2 Spare parts catalog. 235459 K-SA6D108-1C2 KOMATSU Diesel Engine K-SA6D108-1C2 Spare parts catalog. 235460 S6D108-1 KOMATSU Diesel Engine S6D108-1 Service(Shop) Manual. 235461 S6D108-1B KOMATSU Diesel Engine S6D108-1B Spare parts catalog. 235462 S6D108-1C-6 KOMATSU Diesel Engine S6D108-1C-6 Spare parts catalog. 235463 S6D108-1D-6N KOMATSU Diesel Engine S6D108-1D-6N Spare parts catalog. 235464 S6D108-1D-6S KOMATSU Diesel Engine S6D108-1D-6S Spare parts catalog. 235465 S6D108-1D-6T KOMATSU Diesel EngineS6D108-1D-6T Spare parts catalog. 235466 S6D108-1D-S KOMATSU Diesel Engine S6D108-1D-S Spare parts catalog. 235467 S6D108-1D-SN KOMATSU Diesel Engine S6D108-1D-SN Spare parts catalog. 235468 S6D108-1D-TN KOMATSU Diesel Engine S6D108-1D-TN Spare parts catalog. 235469 S6D108-1E-6H KOMATSU Diesel Engine S6D108-1E-6H Spare parts catalog. 235470 S6D108-1E-6N KOMATSU Diesel Engine S6D108-1E-6N Spare parts catalog. 235471 S6D108-1E-6S KOMATSU Diesel Engine S6D108-1E-6S Spare parts catalog. 235472 S6D108-1E-6T KOMATSU Diesel Engine S6D108-1E-6T Spare parts catalog. 235473 S6D108-1F KOMATSU Diesel Engine S6D108-1F Spare parts catalog. 235474 S6D108-1F-6 KOMATSU Diesel Engine S6D108-1F-6 Spare parts catalog. 235475 S6D108-1G KOMATSU Diesel Engine S6D108-1G Spare parts catalog. 235476 S6D108-1G-6 KOMATSU Diesel Engine S6D108-1G-6 Spare parts catalog. 235477 S6D108-2 KOMATSU Diesel Engine S6D108-2 Service(Shop) Manual. 235478 S6D108E-2-16 KOMATSU Diesel Engine S6D108E-2-16 Spare parts catalog. 235479 S6D108E-2-26 KOMATSU Diesel EngineS6D108E-2-26 Spare parts catalog. 235480 S6D108E-2A-N6 KOMATSU Diesel Engine S6D108E-2A-N6 Spare parts catalog. 235481 S6D108E-2A-S6 KOMATSU Diesel Engine S6D108E-2A-S6 Spare parts catalog. 235482 S6D108E-2-D3 KOMATSU Diesel Engine S6D108E-2-D3 Spare parts catalog. 235483 S6D108E-2D-6 KOMATSU Diesel Engine S6D108E-2D-6 Spare parts catalog. 235484 SA6D108-1 KOMATSU Diesel Engine SA6D108-1 Service(Shop) Manual. 235485 SA6D108-1A KOMATSU Diesel Engine SA6D108-1A Spare parts catalog. 235486 SA6D108-1A-7 KOMATSU Diesel Engine SA6D108-1A-7 Spare parts catalog. 235487 SA6D108-1A-7C KOMATSU Diesel Engine SA6D108-1A-7C Spare parts catalog. 235488 SA6D108-1A-7T KOMATSU Diesel Engine SA6D108-1A-7T Spare parts catalog. 235489 SA6D108-1A-C KOMATSU Diesel Engine SA6D108-1A-C Spare parts catalog. 235490 SA6D108-1A-T KOMATSU Diesel Engine SA6D108-1A-T Spare parts catalog. 235491 SA6D108-1B-T KOMATSU Diesel Engine SA6D108-1B-T Spare parts catalog. 235492 SA6D108-1C-7D KOMATSU Diesel Engine SA6D108-1C-7D Spare parts catalog. 235493 SA6D108-1C-7H KOMATSU Diesel Engine SA6D108-1C-7H Spare parts catalog. 235494 SA6D108-1C-7S KOMATSU Diesel Engine SA6D108-1C-7S Spare parts catalog. 235495 SA6D108-1C-7T KOMATSU Diesel Engine SA6D108-1C-7T Spare parts catalog. 235496 SA6D108-1D KOMATSU Diesel Engine SA6D108-1D Spare parts catalog. 235497 SA6D108-1D1 KOMATSU Diesel Engine SA6D108-1D1 Spare parts catalog. 235498 SA6D108-1F-7T KOMATSU Diesel Engine SA6D108-1F-7T Spare parts catalog. 235499 SA6D108-1G KOMATSU Diesel Engine SA6D108-1G Spare parts catalog. 235500 SA6D108-1G-7 KOMATSU Diesel Engine SA6D108-1G-7 Spare parts catalog. 235501 SA6D108-1J KOMATSU Diesel Engine SA6D108-1J Spare parts catalog. 235502 SA6D108-2 KOMATSU Diesel Engine SA6D108-2 Service(Shop) Manual. 235503 SA6D108E-2A-H7 KOMATSU Diesel Engine SA6D108E-2A-H7 Spare parts catalog. 235504 SA6D108E-2A-N7 KOMATSU Diesel Engine SA6D108E-2A-N7 Spare parts catalog. 235505 SA6D108E-2A-S7 KOMATSU Diesel Engine SA6D108E-2A-S7 Spare parts catalog. 235506 SA6D108E-2-D4 KOMATSU Diesel Engine SA6D108E-2-D4 Spare parts catalog. 235507 SAA6D108-2 KOMATSU Diesel Engine SAA6D108-2 Service(Shop) Manual. 235508 SAA6D108E-2A KOMATSU Diesel Engine SAA6D108E-2A Spare parts catalog. 235509 SAA6D108E-2A-8 KOMATSU Diesel Engine SAA6D108E-2A-8 Spare parts catalog. 235510 SAA6D108E-2A-C KOMATSU Diesel EngineSAA6D108E-2A-C Spare parts catalog. 235511 SAA6D108E-2A-C8 KOMATSU Diesel Engine SAA6D108E-2A-C8 Spare parts catalog. 235512 SAA6D108E-2A-P KOMATSU Diesel EngineSAA6D108E-2A-P Spare parts catalog. 235513 SAA6D108E-2A-P8 KOMATSU Diesel Engine SAA6D108E-2A-P8 Spare parts catalog. 235514 SAA6D108E-2B-H8 KOMATSU Diesel Engine SAA6D108E-2B-H8 Spare parts catalog. 235515 SAA6D108E-2B-N8 KOMATSU Diesel Engine SAA6D108E-2B-N8 Spare parts catalog. 235516 SAA6D108E-2B-S8 KOMATSU Diesel Engine SAA6D108E-2B-S8 Spare parts catalog. 235517 SAA6D108E-2C-8 KOMATSU Diesel Engine SAA6D108E-2C-8 Spare parts catalog. 235518 SAA6D108E-2C-N8 KOMATSU Diesel Engine SAA6D108E-2C-N8 Spare parts catalog.